How to reach Catarata Del Toro and Blue Falls of Costa Rica easy. Reaching Catarata Del Toro and Blue Falls of Costa Rica is actually very easy. Use Google Maps or Waze – ‘Catarata Del Toro’ and voila! But even then, they sometimes lead you completely wrong, so, to be 100% secure, drive first to: ‘Bajos del Toro – Alajuela – Valverde Vega’. And when you are almost there change to ‘Catarata Del Toro’ and this works! You do not need a 4×4 to reach us, however, it will be much more fun for the rest of your Costarican trip. So, any car can make it to our place, access roads are all paved. Tip: download the offline maps to your cell phone or tablet before coming to Costa Rica. Know that Catarata Del Toro and Blue Falls of Costa Rica always fit in everybody’s schedule. You can easily combine a visit to Catarata Del Toro and Blue Falls of Costa Rica on your way to or from the Arenal area or the Saripiquí area. It is worth the effort and you will love it and therefore, no matter how but pay us a visit! Monday to Saturday 07.00 – 17.00 hours, Sunday closed. and when you are traveling by bus. Know that the roads, signs and the way of driving in Costa Rica, are slightly different than most visitors are used to. Going downhill can be a new tricky experience for many and therefore, you always need to use the compression of your engine. For automatic cars put it in 2 or 1 or L and for the manual shift cars do use the low gear 1 or 2. Doing so, will keep your breaks available for when you really need them and not doing so, can lead to very dangerous situations. The GPS which comes with the car does not work and even after all those years we still do not exist. Bajos Del Toro does, but sometimes the GPS let the people make a loop for hours! Use a real map instead or the before mentioned apps. You should be able to drive in daytime and nighttime just drive slowly and carefully and expect the unexpected. Obey the rules and laws as traffic tickets are very high and know where is North, South, East, and West. Use a map and common sense and always have a good spare tire and know how to use it. Have a flashlight and enough drinking water in the car and some cash money. And finally, fill up the tank when you have the chance and please do not forget to enjoy this amazingly beautiful country. Welcome, now you will see the real Costa Rica. And when lost, enjoy the moment and just keep going! Take the Inter-Americana Highway (ruta 1) to the North – direction San Ramon. Take the exit Naranjo and follow the signs to Zarcero, you will go through downtown Naranjo. And as you enter Zarcero turn right after the church and park. This will lead you uphill to Palmira – Pueblo Nuevo and then down to Bajos Del Toro, just keep going. And after 6 kilometers and 3 bridges, you will find Catarata Del Toro and Blue Falls of Costa Rica on your left-hand side. Welcome! This route will take 90 minutes from the airport and 2 hours from San José. Take the Inter-Americana Highway (ruta 1) to the North and take the exit Grecia. Drive through Grecia and after the red church, turn left, and left again followed by a right and pass the mall ‘Plaza Grecia’. Follow this road for 5 kilometers until you enter Sarchí. At the famous Joaquin Chaverri Cart factory turn right, followed by left and right again and follow this road for the next 25 kilometers. You can choose the ‘La Luisa’ or the ‘San Pedro’ route, the latter is shorter and faster. The road has scenic views and after going down you will enter Bajos Del Toro. Keep going and after 6 kilometers and 3 bridges, you will find Catarata Del Toro and Blue Falls of Costa Rica on your left-hand side, welcome! This scenic route will take 90 minutes from the airport and 2 hours from San José. Take ‘ruta 4’ towards Arenal – La Fortuna and get off the main road after a few kilometers at the new intersection to La Fortuna by turning right. At top of the viaduct turn left and follow the road all the way to San Miguel, what is the actually the old main road. In San Miguel turn right and drive towards Rio Cuatro, pass this town. Keep going straight, pass the bridge, go up and then after 1 kilometer take first turn left. We have signs there! Drive for 14 kilometers uphill what will take you 15 to 20 minutes and you will pass first the town of La Colonia followed shortly after by a new Bailey bridge. Just keep going for another 7 minutes and finally, you will find Catarata Del Toro and Blue Falls of Costa Rica on your right-hand side, welcome! This route will take 60 minutes and if this is a detour on your way to La Fortuna it will cost you only 30 minutes extra. Take the road to Muelle (ruta 4), continue road, take exit Aquas Zarcas and in Aquas Zarcas turn left towards Venecia. Pass Venecia using the main road and after 3 kilometers you will pass a big bridge over the Rio Toro, then just 2 kilometers more and turn right. We have signs there! Drive for 14 kilometers uphill what will take you 15 to 20 minutes and you will pass first the town of La Colonia followed shortly after by a new Bailey bridge. Just keep going for another 7 minutes and finally, you will find Catarata Del Toro and Blue Falls of Costa Rica on your right-hand side, welcome! This route will take 90 minutes. From the Poás Volcano park drive back to the town of Poasito: turn left on ruta 120 and after 6 kilometers you will see an intersection, with on the opposite side a gas station: turn left. The road leads you to Varablanca, Cariblanco and finally to San Miquel. When reaching San Miquel, make an almost 180 degrees left turn. After 4 kilometers, you will pass the town of Rio Cuatro. Keep going straight, pass the bridge, go up and then after 1 kilometer take first turn left. We have signs there! Drive for 14 kilometers uphill what will take you 15 to 20 minutes and you will pass first the town of La Colonia followed shortly after by a new Bailey bridge. Just keep going for another 7 minutes and finally, you will find Catarata Del Toro and Blue Falls of Costa Rica on your right-hand side, welcome! This route will take 75 minutes. Drive first to the Inter-Americana (ruta 1) and turn right towards San José – San Ramon. After the mountains, you will pass San Ramon, till here it will be 1 hour. Keep going on the highway towards San José. Take Exit Naranjo and follow the signs Zarcero, you will go through downtown Naranjo. As you enter Zarcero turn right after the church and park. 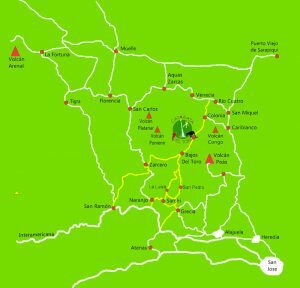 This will lead you uphill to Palmira – Pueblo Nuevo and then down to Bajos Del Toro. Keep going. After 6 kilometers and 3 bridges, you will find Catarata Del Toro and Blue Falls of Costa Rica on your left-hand side. Welcome! This route will take 2 hours. Drive first to the Inter-Americana (ruta 1) and turn right towards San José – San Ramon. After the mountains, you will pass San Ramon, till here it will be one hour. Keep going on the highway towards San José. Take Exit Naranjo – go up 2 kilometers and turn right to Sarchí. Just before Sarchí, you will see big signs of ‘Botanical Garden Else Kientzler’. Follow those signs and if you are in front of their place just keep driving uphill for the next 45 minutes. The road will bring you higher and higher and just keep going and enjoy the views until the road goes down again you will enter the town Bajos Del Toro Amarillo. Keep going and after 6 kilometers you will find Catarata Del Toro and Blue Falls of Costa Rica on your left-hand side. Welcome! This scenic route will take 2 hours. Drive to Sarchí and just before Sarchí you will see big signs of ‘Botanical Garden Else Kientzler’. Follow those signs and if you are in front of their place just keep driving uphill for the next 45 minutes. The road will bring you higher and higher and just keep going and enjoy the views until the road goes down again you will enter the town Bajos Del Toro Amarillo. Keep going and after 6 kilometers you will find Catarata Del Toro and Blue Falls of Costa Rica on your left-hand side, welcome! This scenic route will take 60 minutes. Drive to Zarcero and as you enter Zarcero turn right after the church and park and this will lead you uphill to Palmira – Pueblo Nuevo and then down to Bajos Del Toro. Keep going and after 6 kilometers and 3 bridges, you will find Catarata Del Toro and Blue Falls of Costa Rica on your left-hand side, welcome! This route will take 60 minutes. Drive to Zarcero and as you enter Zarcero turn left before the church and park and this will lead you uphill to Palmira – Pueblo Nuevo and then down to Bajos Del Toro. Keep going and after 6 kilometers and 3 bridges, you will find Catarata Del Toro and Blue Falls of Costa Rica on your left-hand side, welcome! This route will take 90 minutes. Try to find in San Carlos the road to Aquas Zarcas or La Marina an if you pass a Delta gas station within 5 minutes you are on the right track. Drive straight through Aguas Zarcas to Venecia and 3 kilometers after Venecia you will pass a big bridge over the Rio Toro, then just 2 kilometers more and turn right. We have signs there! Drive for 14 kilometers uphill what will take you 15 to 20 minutes and you will pass first the town of La Colonia followed shortly after by a new Bailey bridge. Just keep going for another 7 minutes and finally, you will find Catarata Del Toro and Blue Falls of Costa Rica on your right-hand side, welcome! This route will take 60 minutes. – You should be driving at 14.00 hours latest! – If not, maybe it is better the next day so you can do the trails in peace. – And be aware of our opening hours! – You should be driving at 16.00 hours latest, so you will reach Catarata Del Toro around dark. – If not, probably it is better to sleep the first night in Alajuela, and do not choose San José. – And start driving next morning early. – To arrive later than 18.00 hours you need to verify first if this is possible! – Many do and many wish they should not have done it :). – We always drive but we leave it up to you. Catarata Del Toro, 6km north of Bajos Del Toro, Monday to Saturday 07.00 – 17.00 hours, Sunday closed. Sorry, to inform you but there is no direct bus service anymore! – Start early and take the bus to San Carlos or Zarcero and get off in Zarcero. – Diagonally from your bus stop, you will find the informal taxis. – They will bring you to the Catarata Del Toro for C15.000 and it will take approximately 40 minutes. – If you ask them to wait 2-3 hours you pay a little bit more. – Instead of the informal taxis, you can also use the officially red taxis. – For all, do not pay more than C15.000 and make sure you make the price arrangement before you get in! – This way of traveling is not too expensive, especially when traveling with more than 1 person. – Go back with same taxi to Zarcero. – Take a hitchhike downhill (14 kilometers) to the intersection with route 140. – Or take a local informal taxi and they will bring you there for around C7.000. – From where you can find buses to the Sarapiquí area or to San Carlos or la Fortuna – Arenal. – Start early and take the bus to Zarcero and get off in Zarcero. – Next to the bus stop, you will find the informal taxis. – They will bring you to the Catarata Del Toro for C15.000 and it will take you around 40 minutes. – After your visit to Catarata Del Toro continue with your travel plans. – Take the bus to Rio Cuatro and from there take an informal taxi to Catarata Del Toro. – They will bring you to the Catarata Del Toro for around C7.000 and it will take you around 20 minutes. – For all, do not pay much more than C7.000 and make sure you make the price arrangement before you get in! All the above: you can make any combination as you wish. – Go to Alajuela bus terminal with a taxi on the other side of airport parking lot. – This will cost you only C2.000-C3.000 as it is only 2 kilometers from the airport. – You should be on the bus at 12.00 hours latest! – If not let the taxi take you to your hostel or hotel in Alajuela and not in San Jóse. – And start the next day early. – Around 13.00 hours you are in Zarcero that makes 14.00 hours arriving with a taxi at Catarata Del Toro. – Remember our opening hours! – You should be on the bus at 16.00 hours latest! – If not let the taxi take you to your hostel or hotel in Alajuela and not in San Jóse!